Brain Cooling (Hypothermia Therapy): Where are We Headed? Brain Cooling (Hypothermia Therapy): Where are We Headed? Hypothermia Therapy Past, Present and Future: Where is Brain Cooling Headed? May 31, 2016 /0 Comments/in Hypoxic Ischemic Encephalopathy (HIE) /by Reiter & Walsh, P.C. While hypothermia cooling therapy (also know as therapeutic hypothermia or hypothermia treatment) is now the standard of care for treating newborns with hypoxic ischemic encephalopathy (HIE), this was not always the case. The practices of head cooling, whole-body cooling or cooling blanket therapy was only adopted as the standard of care in 2010 by the AHA and ILCOR; prior to that point, care was – in the majority of cases – simply supportive. Now, researchers are studying methods of increasing hypothermia therapy’s effectiveness, conducting clinical trials into therapies that could potentially work in conjunction with hypothermia therapy to further decrease the level of brain damage that an infant sustains. The study that initially suggested the efficacy of using therapeutic hypothermia for treating neonates with HIE occurred more than a decade ago.The CoolCap trial began enrollment between June 1999 and January 2002, and follow-up was finished in September 2003. Randomized controlled trials confirm the efficacy of therapeutic hypothermia in neonates with moderate to severe HIE, though the criteria for inclusion varied by study. In 2012/3, the seminal Cochrane Review “Cooling for newborns with hypoxic ischaemic encephalopathy” signaled the adoption of therapeutic hypothermia as a standard of care for the treatment of newborns with hypoxic ischemic encephalopathy (HIE). The study found that hypothermia therapy decreased the number of instances of (1) infant mortality and (2) major neurodevelopmental disability after 18 months. Follow-up studies found that at 6-7 years, the children who had been treated with hypothermia therapy had lower rates of death or IQ score under 70, as well as a lower chance of moderate-to-severe disability. Now that hypothermia therapy (both in the head cooling and cooling blanket/whole-body cooling varieties) has been recognized and established as the standard of care for newborns with HIE, the focus has shifted from finding a way to treat the condition at all to how to improve its efficacy. While brain cooling is often done in certain regional hospitals, some health centers have also equipped their emergency response teams and ambulances with neonatal hypothermia therapy equipment to ensure that infants get cooling as soon as possible. The treatment must be administered within six hours* of the initial hypoxia-causing incident (which in most cases is at birth). For example, Texas Children’s Hospital in Houston, Texas has now installed hypothermia whole-body cooling systems in their ambulances to make sure that newborns transported to their NICU received treatment within this narrow window and are not over- or under-cooled. The California Transport Cooling Trial (CTCT) has also recently completed study of a similar topic, studying the efficacy of the TecoTherm Neo cooling blanket’s servo-regulated system in holding babies’ body temperatures steady. Prior to this health system’s installation of the CritiCool system, medical staff would passively cool infants on the way to the NICU, but temperature regulation using passive cooling can be difficult, resulting in either over-cooling or under-cooling, both of which could have negative effects. CritiCool offers precise temperature regulation to ensure infants are cooled to 33.5 degrees Celsius (92.3 Fahrenheit), rather than relying on less reliable cooling and measurement methods. The total duration of the cooling is 72 hours. Optimal timing: Head cooling must begin within six hours of injury, and recent research suggests that the sooner treatment begins, the better – current reports on feasibility and safety indicate that referring centers can begin hypothermia therapy, given adequate staff education. The recent ICE trial confirms that it is possible for referring hospitals to use simple ice packs to begin hypothermia therapy while waiting to transfer the infant to an NICU capable of providing full hypothermia therapy. Optimal duration: Current literature suggests providing hypothermia therapy for 72 hours, though some research suggests that the greater the initial injury severity, the longer the duration of hypothermia needed to optimally protect the brain. A currently-ongoing study is looking into the impact of longer and deeper hypothermia therapy cooling. Optimal method: Currently, infants are cooled in one of two ways – selective head cooling and whole-body cooling. The merits and shortcomings of each (relative to each other) are as yet unknown. Optimal rewarming time: Rewarming the infant is critical, as reperfusion injury can make existing brain injury worse. Clinical trials rewarm infants gradually over 6-8 hours. Optimal selection of newborns for treatment: The CoolCap trials suggested that the infants with the most severe aEEG changes may not have benefitted from head cooling, and that the procedure was beneficial only to infants with less severe aEEG changes. Further research must be done into assisting infants with the most severe grades of HIE. Infants who have suffered a hypoxic-ischemic injury can require resuscitation after birth. Doctors should be following Neonatal Resuscitation Program (NRP) guidelines to ensure they are conducting the procedure correctly. Studies are underway investigating whether infants should be resuscitated with room air vs. 100% oxygen, though currently guidelines from ILCOR and NRP recommend the use of 21% oxygen for resuscitating term infants. If the baby doesn’t improve even when ventilation is adequate for their needs, they then switch to higher oxygen concentrations, guided by pulse oximetry. Other care for hypoxic-ischemic encephalopathy includes resuscitation and stabilization, supportive measures (focusing on providing oxygen and adequate blood flow), fluid, electrolyte and blood sugar management, and seizure treatment. Interventions other than hypothermia therapy seek to prevent further brain injury. The following graphic demonstrates some areas of HIE treatment research, either alone or in tandem with hypothermia therapy. Currently, prophylactic barbiturates, erythropoietin (EPO), allopurinol, and several other therapies are being investigated for safety and efficacy. We have written about future directions of HIE treatment extensively as well. Hypothermia therapy is an effective standard-of-care treatment for HIE, though is is important that researchers continue to conduct investigations into optimizing the therapy to ensure the best possible outcomes for injured children. The therapy must be administered using strict protocols at regional referral centers that offer comprehensive multidisciplinary care and conduct planning to follow up on long-term neurodevelopmental outcomes. It is the responsibility of hospitals and medical staff to be thoroughly and continually educated on hypothermia therapy so as to avoid complications and provide care that conforms with standards of care. If your child received hypothermia therapy for their HIE in the United States, it is important to investigate why their HIE occurred in the first place. Although no parent wants to believe that their child will have a brain injury because of a doctor’s mistake, medical errors are unfortunately more common than we would like to believe. If you would like a second look at the way your child’s prenatal care, birth and delivery were handled, the birth injury attorneys at Reiter & Walsh ABC Law Centers would be happy to provide a free case evaluation and provide you with information about your legal options. We practice law throughout the entirety of the U.S., and can provide you with information on specific medical malpractice laws in your state – be it Michigan, Ohio, Pennsylvania, or another state. Please feel free to contact us 24/7 via phone, email or live chat. 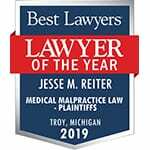 In this video, Michigan HIE lawyers Jesse Reiter and Rebecca Walsh discuss the causes of and treatments for HIE. Negligence by the medical team is often the cause of HIE and birth asphyxia. How Do You Pronounce Hypoxic-Ischemic Encephalopathy? How Long Should Pregnancies Last? Experts Reach 39-Week Consensus; Recommend... Why Do Babies Get Brain Cooling?